Yesterday I dressed up like Wonder Woman and ran a 10K race! Yes! I had a blast! 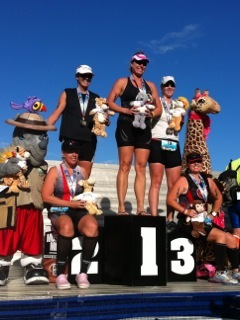 And it was so much fun to hear the spectators yell "Go Wonder Woman" at me! I also got to meet a few readers!!! It always floors me when people say they read my blog! Thanks sooo much!!! I promise to get a race recap up this week! Friday night the family went to see a movie with my friend Stephanie and her family! 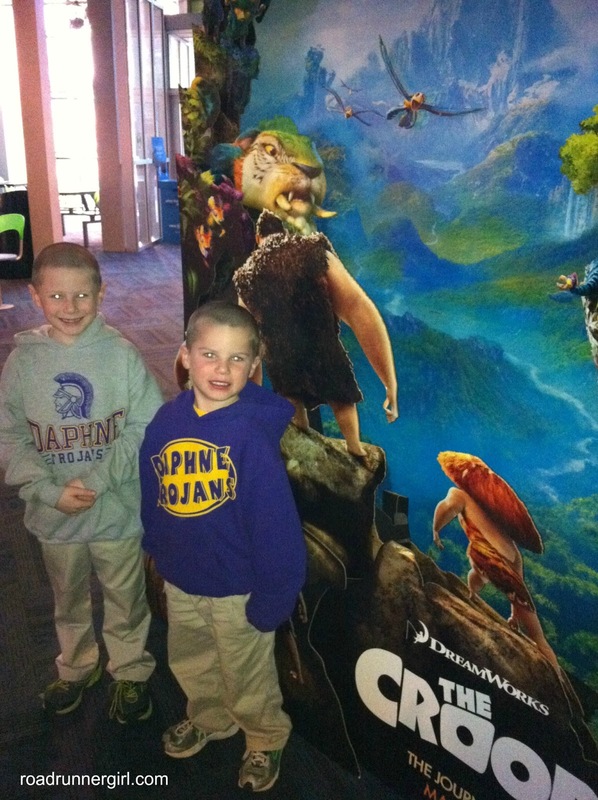 We went to see "The Croods!" It was super cute! My boys loved it! Today it's time for another runner spotlight! If you are interested in being spotlighted on my blog please email me at mindy@roadrunnergirl.com! I'd love to spotlight you! Today's spotlight is a little different! 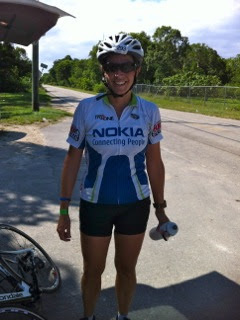 I am spotlighting a triathlete today...Cristina from Triathlon Mami! I got to know Cristina this summer when we starting planking and discussing it on Twitter! She's one of the original #planktweeps! She is an awesome athlete, mom, and teacher!!! Keep reading to learn more about her! When and why did you start running, swimming, and biking? I began swimming as a kid, and I stopped swimming when I was still a kid! I played Volleyball and Tennis most of my life but I had always enjoyed long, sweaty endeavors. In 2010 a friend, who was as equally unprepared as I was, asked me if I would train with her for a Sprint Triathlon (.25 mile swim, 10 mile bike, 3.1 mile run) and I said sure. That was my initiation. I have done a variety of races but so far my best experience is Miami Man a Half Ironman distance (1.2 mile swim, 56 mile bike, 13.1 mile run). The swim is in a lake which is very different for me as I swim mostly in the ocean. The bike is windy but completely flat through farms and fields, and the run is inside the Miami Zoo where it’s full of people and where I was able to see my family. They had fun enjoying the zoo while I was racing! I wake up super early, and have a cup of coffee and one waffle with almond butter. I triple-check I have everything I need and dress myself last. I get to the race site early and just take in the moment, noticing my anxiety and finally feeling comfortable with it. What is your most favorite piece of gear? My bike. A sponsor gave me a Cannondale Slice and I am in love with it. I enjoy riding it every time and when its just sitting there inside my apartment I look at it and want to jump on it to go for a ride. Do you follow any diet or take any specific supplements that complement your training? I should, I guess … but I don’t. My nutrition leaves much to be desired. What do you wish you’d known when you first started training to be a triathlete? That you don’t have to sign up for EVERY race which is what I did before and burned out! 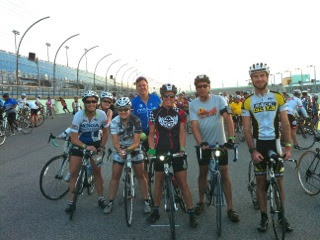 What is your fondest running, swimming, and/or biking memory? I have many but here are three. My first race with my two friends with whom I trained, we were all equally unfit and unprepared. Finishing my first half ironman, the feeling of accomplishment was overwhelming and seeing my family as well as my two friends there made it even more special. 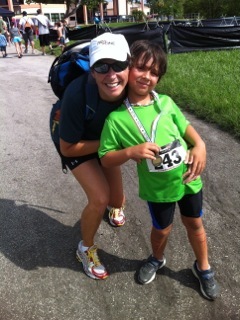 Seeing my boys compete in their first kids triathlon at ages five and six. I am a pretty honest blogger so there isn't much that I don’t wear on my sleeve. I do have a very special friend called Bill W who has helped millions of people around the world including me. Here are all the different ways you can connect with Cristina! Thanks so much for sharing with us Cristina!! !